Our Cancer and Immunomodulatory Peptide Libraries allow for hundreds of cancer-related peptides to be analyzed in parallel. This can drastically reduce the time needed for your drug discovery, ligand-binding, or antibody development efforts. The effects of programmed cell death 1 (PD-1)−programmed death 1/2 ligand (PD-L1/2) interaction on T cells. PD-L1/2 is expressed by tumor cells and antigen-presenting cells (APCs). 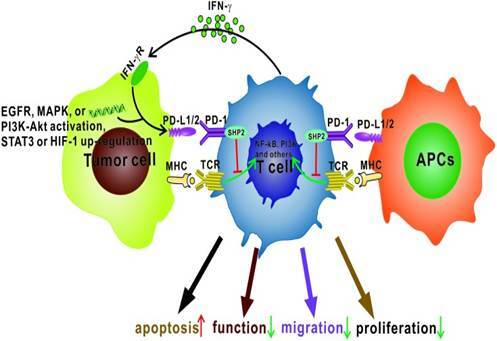 In tumor cells, PD-L1 expression may be induced by interaction between IFN-γ and IFN-γ receptor (IFN-γ R), activation of epidermal growth factor receptor (EGFR), mitogen-activated protein kinase (MAPK), and/or PI3K-Akt signaling pathways, and upregulation of signal transducer and activator of transcription 3 (STAT3) or hypoxia induced factor 1 (HIF-1). Then, interaction of PD-1 with PD-L1 can activate Src homology region 2-containing protein tyrosine phosphatase 2 (SHP2) and inhibit activation of T cell receptor (TCR)/major histocompatibility complex (MHC)-triggered NF-κB, PI3K, or other signaling pathways, leading to increased apoptosis and impaired T cell function, migration, and proliferation. T cell inhibitory receptor PD-1 expressed on tumor cells and tumor-infiltrating APCs neutralizes its ligand, PD-L1, in cis to inhibit canonical PD-1 signaling. Zhao et al. (Cell Rep. 2018 Jul 10;24(2):379-390) show that the T cell inhibitory receptor PD-1 expressed on tumor cells and tumor-infiltrating APCs neutralizes its ligand, PD-L1, in cis to inhibit canonical PD-1 signaling. 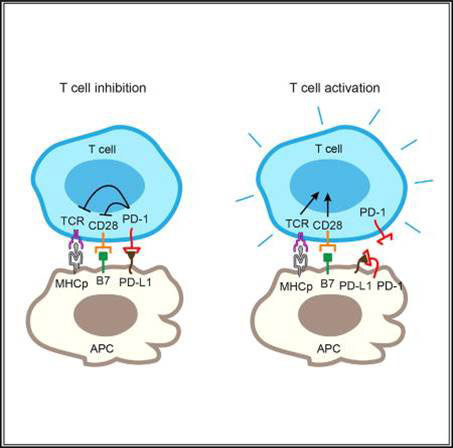 Selective blockade of tumor-intrinsic PD-1 frees up tumor PDL1 for T cell suppression. Peptide/protein that block PD-L1/PD-1 interactions have produced durable clinical benefits.